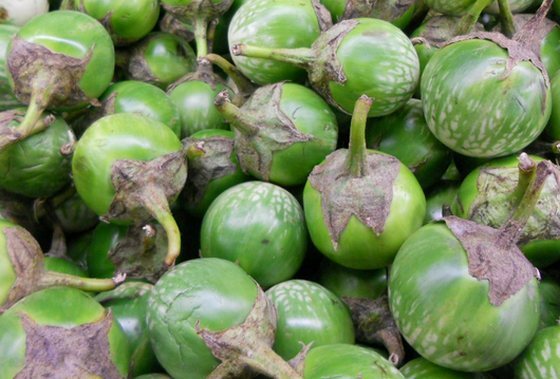 The eggplant, scientific names include Solanum melongena, Solanum gilo and Solanum integrifolium, are delicate perennial plants that are often cultivated as annuals. It is sometimes referred to as Aubergine (especially in Europe), Brinjal, Gilos, Melongene, or Guinea squash, and is part of the Solanaceae family, also known as the nightshades. It a member of the Solanum genus. Its fruit is called under the same name, which is commonly categorized as a vegetable due to its role in several dishes. As a nightshade, it is closely related to Peppers, Potatoes and Tomatoes, and is known to have originated from China and India. Growing Eggplant Photograph by Matsuyuki. Eggplants can grow from 16 to 72 inches (40 to 180 cm) tall, with large coarsely lobed leaves that are about four to eight inches (10 to 20 cm) long and two to four inches (5 to 10 cm) broad. The semi-wild type varients that can grow larger than seven feet (225 cm) tall, and have huge leaves over 12 inches (30 cm) long and six inches (15 cm) broad. The stems are often spiny and they produce white to purple star-shaped flowers—having yellow stamens and a five-lobed corolla. Eggplant fruits have a somewhat meaty texture. Fruits are normally larger in cultivated forms than wild plants; these usually grow to less than one and a half inches (4 cm) in diameter. As there are many varieties this can result in many different colors, shapes, and sizes—the commonest eggplants are purple in color, although there are many green, and even some wild orange varieties. Is the Eggplant a Fruit or Vegetable? Due to the fact that eggplants contain numerous small, soft and edible seeds, they are botanically classified as a berry. The seeds are bitter because of the nicotinoid alkaloids that they contain; the eggplant is a close relative of tobacco. For best results use a deep, fertile soil. When growing eggplant choose a location that has full sunlight with soil that is well-drained and is enriched in organic matter. Ideally aged compost should be added to the planting beds a couple of weeks prior to planting and the soil pH should be around 5.5 to 6.8. Usage of a black plastic cover can warm the soil in advance of planting. Eggplants can first be grown indoors about six to eight weeks before transplanting outside. The plant is sensitive to cold and requires temperatures in the region of 70 to 90°F (21 to 32°C) for best results. Eggplants are very unlikely to set fruit if temperatures go above 95°F (35°C), or if the temperature drops below 60°F (16°C). Set the eggplant transplants outdoors no sooner than two to three weeks after the last frost date in spring, when daytime is consistently reaching temperatures that is around 70°F (21°C). Planting eggplants too early will not promote growth and development as they are cold tender plants. If there is a late cold snap and temperatures are expected to drop below 50°F (10°C), then it is important to cover the plants to provide protection. 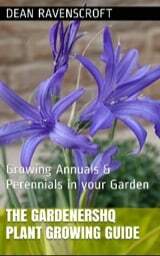 Sow seeds ¼ to ½ inch (5 to 12 mm) deep and germinate at 70 to 90°F (21 to 32°C). Provide moisture by use of misting. Thin them when they reach a height of five to six inches (12 to 15 cm) to a distance of about six inches (15 cm) apart. Transplant successful seedlings outdoors spaced 18 to 24 inches (45 to 60 cm) apart; rows should be 30 to 36 inches (75 to 90 cm) apart. Crowded eggplants will bolt early and go to seed; therefore thinning and spacing is very important. Provide with 14 hours of light in order to encourage a bushy growth. Avoid getting the compost very wet. Water the plants deeply and regularly enough to keep the soil moist; fine spraying can help encourage the setting of fruit. Feed the plant with tomato food after watering once the fruit starts to swell. 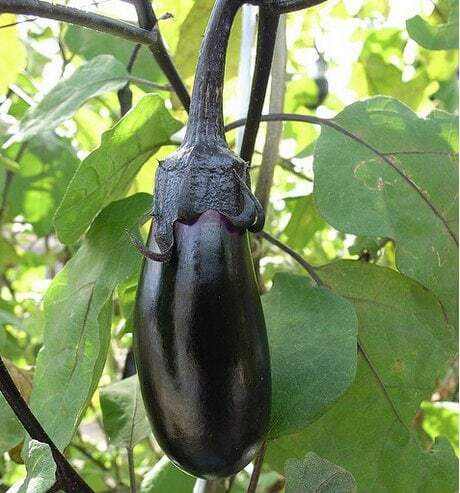 Growing eggplants should have a weekly high-potash liquid feed; the best feed is the one used for tomatoes, although the feed should only be half-strength of that used for tomatoes. Red spider mite is one of the most common pests that can infest both indoor and outdoor grown crops. This problem commonly arises when the humidity is low, and increasing the greenhouse humidity can be of great aid. For plants grown in greenhouses, glasshouse whitefly can also be a problem. Planting repellent plants can discourage infestation. Aphids can also appear on both indoor and outdoor eggplant plants, and they tend to colonize the leaves underside. Treat this by spraying pyrethrum or insecticidal soap. Flea Beetles. Control these by the use of insecticide as they can cause largespread damage by eating the leaves. Crops are ready for harvest as soon as they become glossy, firm and full colored, this usually occurs when they are six to eight inches (15 to 20 cm) in length (depending upon variety). Test for suitability by gently pressing the aubergine with your thumb. The flesh should give a little and bounce back immediately. If it does not give then the eggplant is not ripe, if the flesh does not return to normal once pressed then it is over ripe, and will likely taste very bitter. Harvest can be expected 70 to 85 days after transplanting. The fruits grow on a sturdy stem, so cut the stem with the use of a sharp knife; always maintain some stem when harvesting as they can be very easily bruised. Gather growing eggplant before their flesh becomes pithy. Oval shaped fruits tend to have less seeds and contain more flesh than round eggplants. Eggplants can be stored in the refrigerator for a few days wrapped in plastics; they can also be placed in a cool, dry location to prolong their lifespan. They tend to become bitter upon prolonged storage. So a preferred way of storing them long term is by blanching slices of about a 1/3rd of an inch (1 cm) for four minutes in boiling water containing lemon juice. Following cooling and draining, they should be packaged in a zippable freezer bag, leaving a little space for expansion. Next they should be frozen. University of Illinois Extension; Garden.ie; BBC Gardening; National Vegetable Society; Ohio University Extension; Arizona Cooperative Extension.